July 26, 2017 – Hartford, CT – Hartford Parking Authority (HPA) has announced the launch of “Woonerf,” a mobile parking app for the city’s metered parking spaces. With the introduction of the Woonerf app, HPA has created the foundation for a mobile app that will ultimately provide one total parking solution for residents and visitors. “By providing a custom mobile parking solution, we will be able to make our City more livable and walkable, and support the growth of a new generation choosing to make downtown their home,” said Hartford Parking Authority CEO Eric Boone. “We realize that the world has gotten to a point where most people feel comfortable with the notion that parking can be app-based,” Boone added. 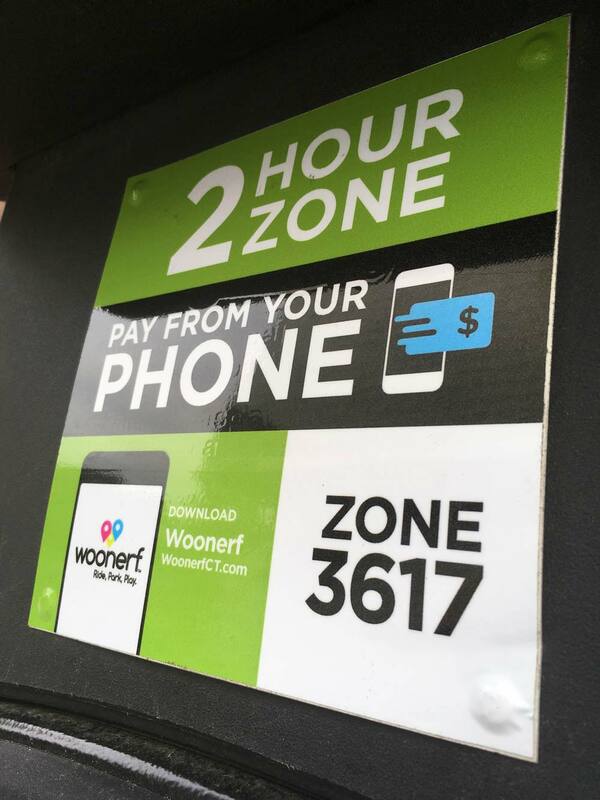 Woonerf will allow motorists to conveniently pay for metered parking with no added fees, extend their parking time, and receive warnings that their time is about to expire. It will also provide merchants the opportunity to validate metered parking for their customers, allow motorists to set up an e-wallet to purchase parking at a discount, and allow motorists to purchase a “bonus” hour if they are in danger of receiving a meter citation. HPA specifically designed the app to allow for future functionality, including off-street parking and information related to other modes of travel, as well as providing other towns the ability to easily join the app. “We leveraged our large meter transaction volume to achieve low credit card processing and app transaction fees. We did this not only to benefit our customers but also to provide other towns the ability to join Woonerf and benefit from our scale,” said Boone. “HPA has received a number of requests from new downtown residents for information related to bicycle parking and Zipcar locations. We intend to incorporate this information into the app in the near future,” according to Boone. HPA will also use the app to take the next step in combating individuals who abuse accessible parking spaces. Starting on September 1, 2017, HPA will no longer allow free on-street, metered parking for motorists displaying accessible parking permits intended for people with disabilities. To help inform parkers, HPA will be placing flyers on all vehicles displaying permits until September 1st. “In the downtown area, one out of six cars in a metered space currently displays an accessible parking permit, indicating there is a significant amount of permit abuse. This means that those truly in need must overcome the challenge and frustration of not being able to access parking in close proximity to the places they frequent,” said Boone. HPA named the app “Woonerf,” which loosely means “living street” in Dutch. Woonerf is a technique that is used by urban designers to encourage the steady and comfortable flow of mobility within a city. HPA chose this unique name to reflect its broader aspirations to make the downtown area more livable and the roads more shareable for motorists, pedestrians, and bicyclists. The Woonerf app is free to download from the App Store and Google Play. Users can also manage their parking online at www.WoonerfCT.com. The Hartford Parking Authority (HPA) meets the needs of parkers Citywide by consistently providing convenient and affordable parking, and strives to be a leader by incorporating parking industry best practices and actively partnering with the City of Hartford in promoting economic and community development. The HPA oversees metered and regulated parking spaces on Hartford streets, as well as operates and maintains the MAT Garage, Sheldon Street Lots and DoNo Surface Lots. For more information, contact the Hartford Parking Authority at 860.527.7275 or visit www.hartfordparking.com. Photo attached: Hartford parking meter kiosk screen featuring payment option with the new Woonerf mobile app.